Definition at line 515 of file RDFGraph.h. Definition at line 887 of file RDFGraph.h. References llvm::rdf::NodeAddr< T >::Addr, llvm::rdf::DataFlowGraph::addr(), assert(), llvm::rdf::NodeAttrs::Code, P, RA, and llvm::rdf::NodeAttrs::Ref. Definition at line 520 of file RDFGraph.h. References assert(), llvm::rdf::NodeAttrs::PhiRef, and llvm::rdf::NodeAttrs::Ref. Definition at line 434 of file RDFGraph.cpp. 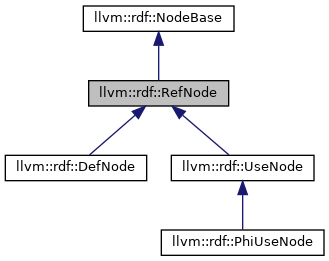 References llvm::rdf::NodeAddr< T >::Addr, llvm::rdf::DataFlowGraph::addr(), llvm::rdf::NodeAttrs::Code, llvm::rdf::NodeBase::getNext(), llvm::rdf::NodeBase::getType(), and llvm_unreachable. Referenced by llvm::rdf::Liveness::computePhiInfo(), and DeadCodeElimination::SetQueue< T >::push_back(). Definition at line 528 of file RDFGraph.h. Referenced by llvm::rdf::Liveness::computeLiveIns(), llvm::rdf::Liveness::computePhiInfo(), llvm::rdf::DataFlowGraph::getNextShadow(), and llvm::rdf::CopyPropagation::interpretAsCopy(). Definition at line 408 of file RDFGraph.cpp. References assert(), llvm::AMDGPU::HSAMD::Kernel::Key::Attrs, llvm::rdf::NodeAttrs::flags(), llvm::rdf::DataFlowGraph::makeRegRef(), llvm::rdf::NodeAttrs::PhiRef, llvm::Ref, llvm::rdf::NodeAttrs::Ref, llvm::rdf::NodeAttrs::type(), and llvm::rdf::DataFlowGraph::unpack(). Referenced by llvm::rdf::Liveness::computePhiInfo(), llvm::rdf::DataFlowGraph::getNextRelated(), llvm::rdf::DataFlowGraph::getNextShadow(), llvm::rdf::printRefHeader(), and llvm::rdf::DataFlowGraph::pushAllDefs(). Definition at line 535 of file RDFGraph.h. 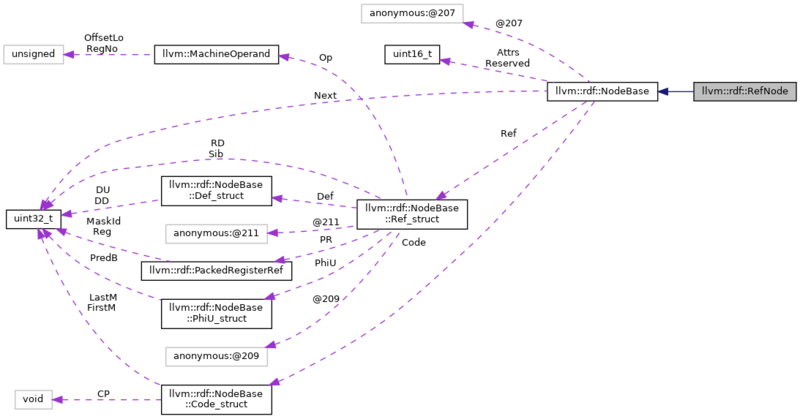 Referenced by llvm::rdf::Liveness::computePhiInfo(), llvm::rdf::Liveness::getAllReachedUses(), llvm::rdf::DataFlowGraph::getNextShadow(), and llvm::rdf::CopyPropagation::run(). Definition at line 547 of file RDFGraph.h. References assert(), llvm::rdf::NodeAttrs::Def, getType(), P, and llvm::rdf::NodeAttrs::Ref. Definition at line 542 of file RDFGraph.h. References assert(), getType(), llvm::rdf::NodeAttrs::Ref, and llvm::rdf::NodeAttrs::Use. Definition at line 531 of file RDFGraph.h. Definition at line 418 of file RDFGraph.cpp. References assert(), llvm::AMDGPU::HSAMD::Kernel::Key::Attrs, llvm::rdf::NodeAttrs::flags(), llvm::rdf::DataFlowGraph::pack(), llvm::rdf::NodeAttrs::PhiRef, llvm::Ref, llvm::rdf::NodeAttrs::Ref, and llvm::rdf::NodeAttrs::type(). Definition at line 426 of file RDFGraph.cpp. References assert(), llvm::AMDGPU::HSAMD::Kernel::Key::Attrs, llvm::rdf::NodeAttrs::flags(), llvm::rdf::NodeAttrs::PhiRef, llvm::Ref, llvm::rdf::NodeAttrs::Ref, and llvm::rdf::NodeAttrs::type(). Definition at line 538 of file RDFGraph.h.